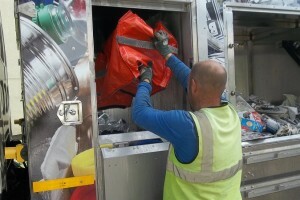 Our services collect different materials in separate bins or bags. This ensures high quality materials with reduced costs – which we pass on to you. Our collection system is fully compliant with TEEP legislation. 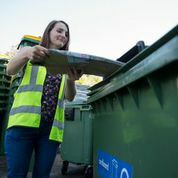 Ideal for businesses that are producing smaller quantities of a range of different waste materials. Being flexible you can occasionally recycle larger quantities of materials within your set price! 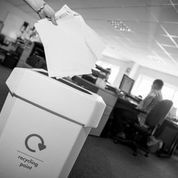 We collect: Cardboard; Paper; Cans/Tins; Plastic packaging (except plastic film); and small electrical items. We can also dispose of IT equipment as a separate service. Ideal if you are producing larger volumes of materials. This is popular with pubs and clubs, industrial sites and larger offices. All our containers are clearly labelled for easy use. 240 or 360 litres for: Cardboard; cans/tins; glass; plastics; paper. Food waste 240 litres only (due to weight). 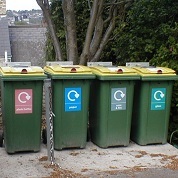 660 or 1,100 litres for: Cardboard; cans/tins; plastics. Call 01633 281 281 today for a no obligations quote.